“I've seen that guy's face somewhere before...” If ever these words have passed your lips and you've then spent hours pondering in which television show, B movie or questionable long distance plan commercial you've seen someone's face, you will know how valuable the Internet Movie Database can be. IMDb Movies & TV is the app to go with the mother of all online movie/TV databases, and we've tested it for you. Read on! First impressions: IMDb Movies & TV has a somewhat sparse feel to it when you first start up the app due to the so-called whitespace. There's a news ticker at the top of the display, but the rest of the screen can be filled with personalised notifications. This is a great start to exploring the IMDB app and we love that users can tailor the notifications according to their own personal preferences. Also, you can adjust how updates are brought to you, i.e. Whether you wish to be notified or are wish to consult the system's own status bar. You can receive notifications re: new updates via LED, sound or vibration, and – get this – you can yourself set the sound and vibrate signals. Awesome! The notification feature can be accessed and used even if you haven't registered with the service, which is a great bonus. You will need to register should you wish to make use of the list (watch list for interesting tv shows and/or movies), however. That said, registering can be done via IMDB.com directly, rather than having to go via Facebook—another cool feature. Movie buffs will enjoy exploring the forums, trivia blurbs, facts and info on cast and crew, as well as lots of other details. There're also some well thought-through film critics and user reviews which can be fun and informative to browse through before or after checking out a new movie or TV show. There's also an option for watching trailers (in different qualities), or else adding trailers to your watch list. Sharing trailers is also an option, and we're happy to report that this happens via the Android integrated share function. Finally, you can use the up to search for cinemas/movie theaters showing films in your surroundings. 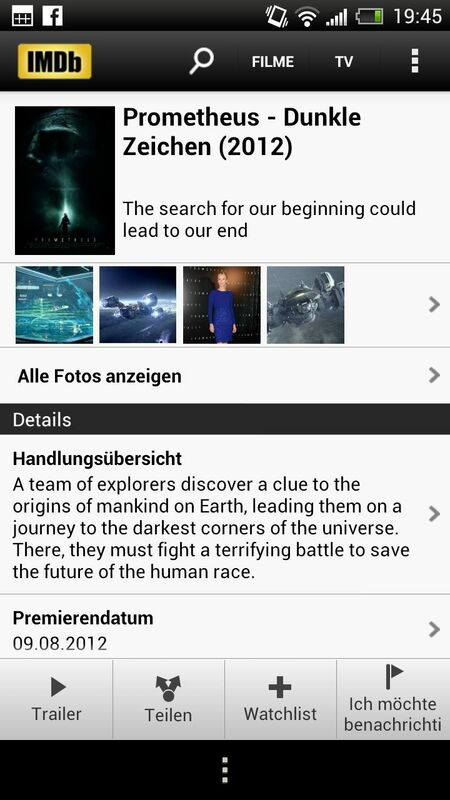 IMDb Movies & TV is a very well made mobile version of the website. One setup is that the database for television shows covers American shows but doesn't include much else. 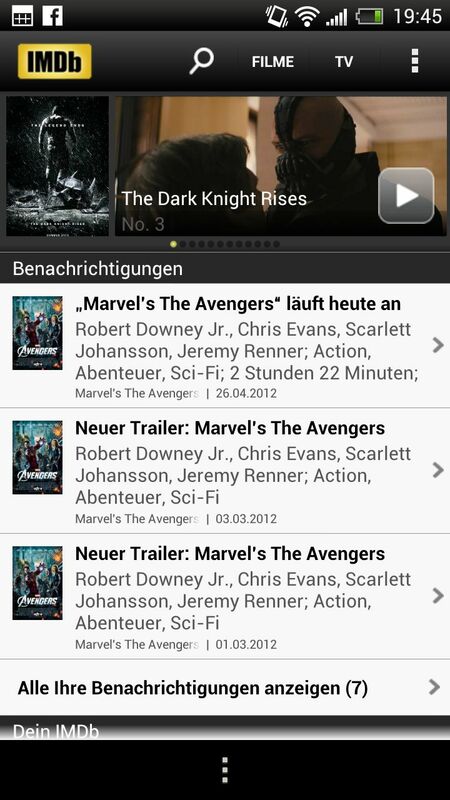 IMDb Movies & TV is nicely adapted to Android 4.0 and has a clean look about it. Controls are comfortable to use and watching trailers works very well. There's still room for improvement when it comes to the fluidity of swiping between different options (e.g. selecting individual movies), but that's really the only tiny complaint we have. 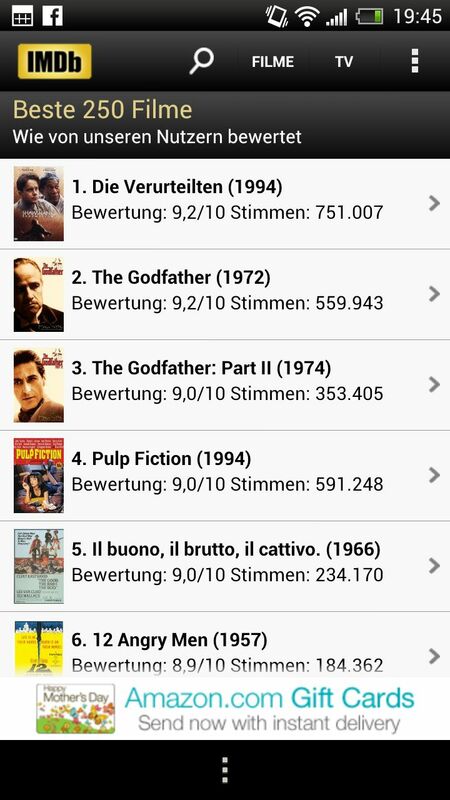 IMDb Movies & TV performed steadily throughout our test phase. It didn't crash or lag and it loads nice and fast—and that's no small feat for an app that features HD video trailers. IMDb Movies & TV is available for free but with ad banners from the Google Play Store; the ad banners are placed at the bottom of the display.